Gifts have been gifted and I can now reveal what became of my recently spun yarn. 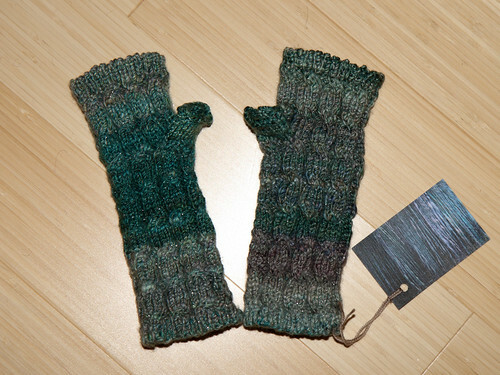 Fingerless mittens turn out to be perfect for accommodating the unevenness of handspun. This pair were knitted from the Fyberspates sparkle fibre, they are ridiculously soft. And this pair from the Colinette fibre. I’m particularly pleased with the Colinette pair – the merino fibre didn’t feel especially fine but the fabric is very soft against the skin. I love the colours too. 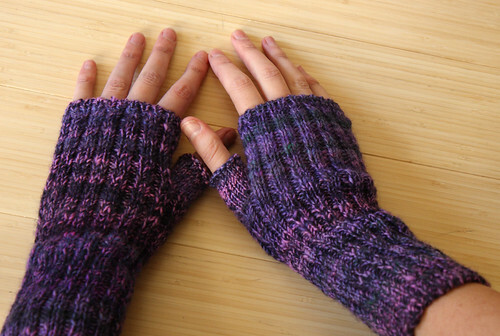 I didn’t have a pattern for either pair, it’s easy to wing it with fingerless mittens as they’re basically just a tube. They’re roughly DK gauge on 4mm needles. The thumb is formed by knitting 8 stitches on scrap yarn at the desired point so it can be unpicked and the thumb tube worked afterwards. This method is described in full in this pattern. It’s the finishing that makes or break a simple project; I used the Italian tubular cast on and tubular bind off for stretchy, attractive edges on the ribbed edges, and Jeny’s surprisingly stretchy bind off on the thumb. These are well worth the extra effort.